Karpis, Hunter, and Connie Morris, now in Rockport, Texas, had arranged to meet Goldstein in two weeks on a side road outside Hot Springs, but when they read about the raid, they decided to leave immediately for New Orleans. They drove there in Hunter’s car, and rented two apartments: Morris and Hunter were staying at 3343 Canal, with Karpis’ apartment a mile or so away at 3300 St. Charles. Meanwhile, the agents had picked up Goldstein, and during an interview with her by Connelley on March 31, the day after the raid, she apparently revealed a few details about Hunter and Morris, but denied knowing Karpis. The morning after that interview, conducted at the Hatterie Hotel, the FBI learned two calls had been placed from the hotel; one to Memphis, and one to New Orleans. About 10 days later, Goldstein met Karpis outside Hot Springs as planned. During their meeting, Karpis told Grace to go to her brothers place in Paris, Texas, pick up some machine guns he had left there, and bring them to the apartments in New Orleans. FBI reports confirm she left Hot Springs on April 10 or 11, and didn’t return for several days, and then let immediately for New Orleans. Upon her arrival, she told Karpis the FBI had been watching her brother’s house and the machine guns were inaccessible because her brother had buried them in his fields so the FBI would not find them. After a brief trip to Florida, Karpis drove Goldstein back to Hot Springs on April 25, but left almost immediately for a fishing trip to Mississippi, returning May 1. Meanwhile, based on information supplied by an informant (there is considerable evidence that informant was Grace Goldstein), the FBI, on April 30, was able to locate the apartments Karpis and Hunter were using. They learned Hunter and Morris had rented apartment 3 under the name Edward O’Hara, the same name Karpis has used to purchase a new Plymouth deluxe coupe for $806 a short time before. Although Karpis was not living at that apartment, the informant said he took all his meals there. The informant also noted that if Karpis was not there, he was likely away fishing, but would return so long as Hunter and Morris were there. On the night of April 30 agents and lawmen began pouring into New Orleans. Also arriving was Hoover, who had vowed to capture Kapris himself. Connelley put Hunter’s place under surveillance, and the following day, Friday, May 1, 1936, at about 9:45 a.m., a man fitting Karpis’ description, drove up to the front of the apartment in a 1936 Plymouth and entered the building. However, because it was not firmly established that both Kapris and Hunter, would be inside, the FBI decided to wait. The man entering the building was about 5'10", thin build, and wearing rim-less glasses, a straw hat, tan trousers and a cream-colored shirt. Shortly before noon, the same man returned to the car, retrieved a magazine and reentered the building. Then, less than 10 minutes later, he, along with a second man, were back on the sidewalk. The second man had a mustache, and was wearing brown pants, a light blue shirt and a soft white summer hat with a wide black headband. The first man got into the coupe, while the second got into a black Plymouth nearby. They proceeded for about a block down Jefferson Davis Parkway, made a U-turn and returned down the parkway toward Canal Street passing in front of the agents. All agreed it was Karpis and Hunter. Within 45 minutes, the pair returned in Karpis’ vehicle, with Karpis driving, parked in front of the building and went in. Agents gathered at 2 p.m. The Public Enemy Crime Wave Era was about to expire; the futures of Karpis, Hoover, and the FBI would all change radically in a span of mere seconds. As the gathered lawmen were still deciding the best way to storm the apartment building, they were surprised to see Karpis and Hunter exit the building and climb into the Plymouth. The lawmen weren’t ready, but it was now or never. That’s when Karpis felt the gun barrel against his head and was told not to move. Agents swarmed in on foot, others by car to block any possible escape. It was that simple and uneventful. After more than five years on the run and a massive nationwide manhunt, the last major public enemy was captured without firing a shot. So is that the end of the story? To paraphrase T.S. Elliot, does it end not with a bang, but with a whimper? And what of Hoover’s role in all of this? Didn’t he vow to make the arrest himself? And considering how long the gang stayed on the run, was it really that good or did it have help from unlikely sources? This photo was taken about three hours after Karpis' arrest. When he was arrested, the agents realized none of them had handcuffs, so one of the agents removed his own necktie and used it to bind Karpis' hands. 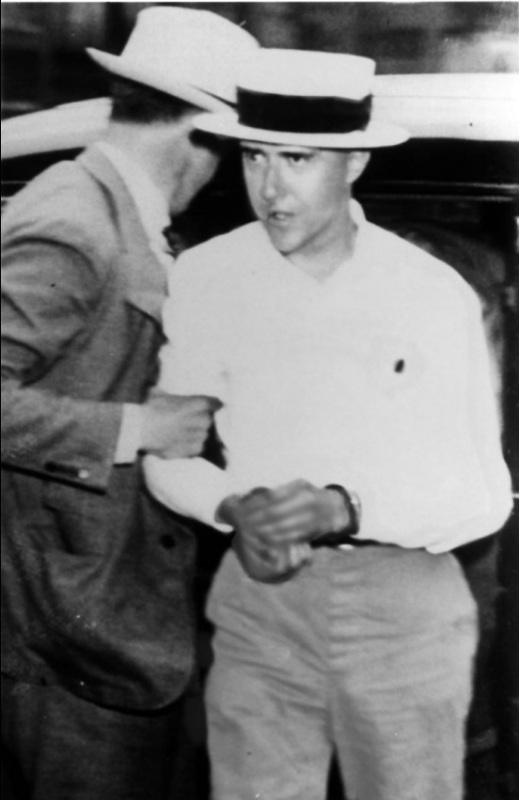 In this photo he is wearing standard handcuffs, indicating he had already been formally arrested and processed.